Breakfast sandwiches are one of the best ways you can start the day (taste-wise, at least). But they tend to be logistically difficult. Either you've got to take the time to carefully assemble one, or pay some scruffy, minimum-wage employee to make one for you. 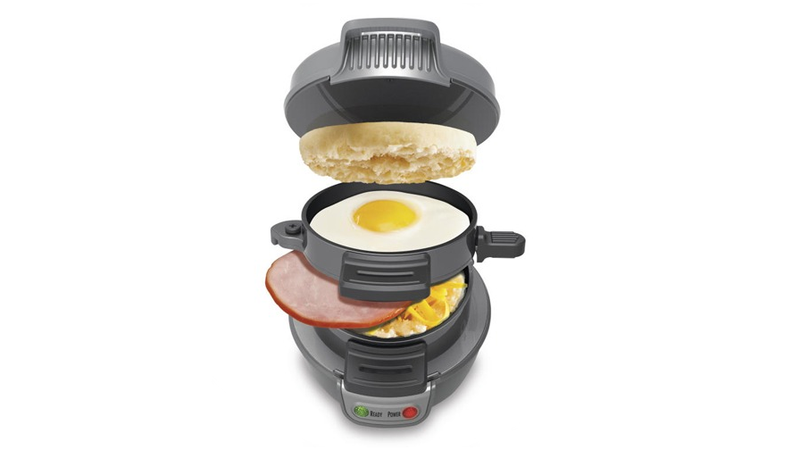 Hamilton Beach's Breakfast Sandwich Maker merges the best of both worlds. A cleverly stacked arsenal of cooking-spaces, the Breakfast Sandwich maker makes multi-tasking a priority. The tower of chow cooks your egg in one compartment on the top, warms a slice of pre-cooked meat in the middle, and warms your cheese and other assorted fillings in a spot of the bottom. All between two English muffins for easy removal. And all this in five minutes or less.